Cottonseed meal—the leftovers after lint and oil are extracted from cottonseed—is typically fed to ruminant livestock, such as cows, or used as fertilizer. But Agricultural Research Service scientists in New Orleans, Louisiana, have other plans for this byproduct of U.S. cotton production—namely, to make interior wood adhesives. 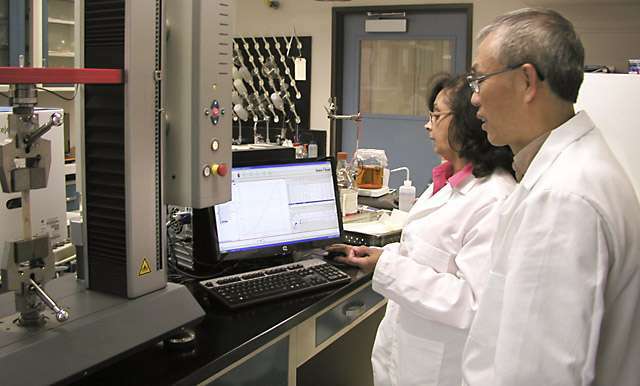 Most such adhesives are derived from petroleum, a nonrenewable resource subject to fluctuating prices and many competing demands, notes chemist Zhongqi He, who is with the ARS Southern Regional Research Center in New Orleans. Cottonseed meal and its protein component have been studied as environmentally friendly, biodegradable, and formaldehyde-free alternatives to petroleum-based bonding agents. But, to date, neither the seed meal nor the protein has been commercially developed into biobased adhesive products. "Defatted seed meal is cheap, but it has poor water resistance," explains He, with the ARS Center's Commodity Utilization Research Unit. The protein component works better as a wood-binding adhesive, he adds, but its extraction from cottonseed meal requires the use of costly and corrosive reagents and solvents. Now, He and his colleagues may have a solution in the form of a water-based, seed-meal washing procedure that keeps the protein in place and instead removes the fractions of the meal that impart the poor water resistance. 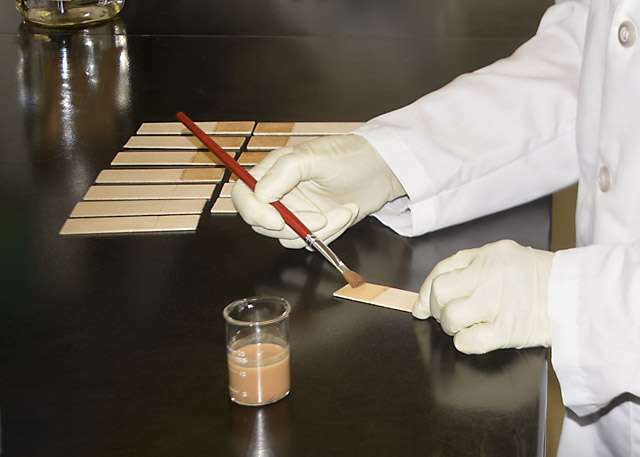 In tests with maple and poplar veneers, the bonding strength water-washed seed-meal adhesives equaled and sometimes surpassed that of protein-only formulations. Raising the temperature at which the veneers were pressed together from 176 ˚F to 230 ˚F generally increased the seed-meal adhesives' bonding strength and water resistance, says He. He's studies also suggest that the bonding properties of the experimental adhesives' protein may be aided by carbohydrate molecules in the water-washed meal. "Cross-linking reactions might occur between some carbohydrate molecules and proteins, making the water-washed meal exhibit its good adhesive properties," says He. He, ARS chemist Dorselyn Chapital, and their coauthors have reported their findings in recent issues of the Journal of American Oil Chemists' Society and the International Journal of Adhesion and Adhesives. Their work also appeared in a recent issue of the Journal of Visualized Experiments. Further research and development of wood adhesives from the washed cottonseed meal could signal a new, value-added use for 1.3 million tons of the byproduct. Soy flour protein now dominates the small biobased-adhesives market. Washed cottonseed meal could offer the advantage of being a renewable adhesives resource that wouldn't compete with human food uses.